[AUTO](RC):When placed, COST [Counter Blast (1)], choose one of your opponent’s rear-guards in the back row, retire it, and this unit gets [Power]+5000 until end of turn. Much like Allen, new Nehalem is basic, but workable. He can’t snipe an attacker, but in this format, I think that might actually be worth more. Even when you take new PG Draw Triggers into account the number of attackers (19 on average) still outweigh the (usually) 14 boosters. On top of that, Grade 1s have 10k shield, which the opponent will have to spend just to replace what you blew up: useful against Accel, where the average Grade 2 has only 9k power. 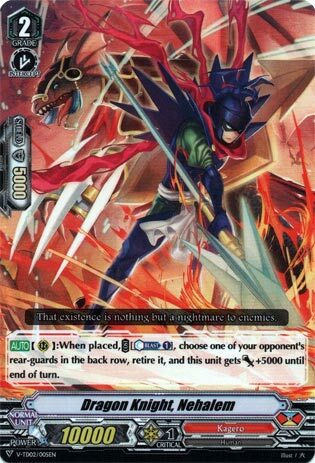 Standard Kagero has this as staple alongside upcoming Berserk Dragon. Run at 4.